Inch by Inch | Johnson City, TN | Peeks Chiropractic, P.C. 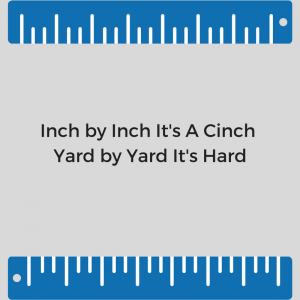 Inch by Inch it’s a cinch, Yard by Yard it’s hard. Anybody not get that? If you don’t or can’t you haven’t raised a child, lost some weight, built a business, learned how to play an instrument, loved in a relationship, painted a beautiful picture, golfed, trained for a 5K, become fluent in a foreign language. 3. Do all the repair work it needs to do without the necessary help of a corrective, regular Chiropractic adjustment (if the adjustment wasn’t necessary the body would have already sorted out the cause of your symptoms, corrected the offending vertebra, put it into motion, kept it in motion, repaired the damage, built new cells, lengthened and strengthened the soft tissue surrounding the damage and turned off the signal it alerted you with at the very beginning. Look, I love ya. I love working on you. I love seeing how few visits it takes to get the healing ball rolling. Remember, I have an instrument I share the readings with patients all the time. You know what an instrument reading should look like (if you don’t…the straighter the better, it’s that simple). I take pre-adjustment readings (that tells me what you have been doing in between the visits). I take a post reading (that tells me what I did while you were in my office). My work is checked every time I see you. I know where we stand with your recovery or maintenance of your health. I don’t want to waste your time or your visits because I know that EVERYBODY has a limited amount of TIME, ENERGY and MONEY. Nevertheless, I also know that healing comes back one inch at a time. I want you to feel like you used to. I want you to do whatever it is you find fulfilling and important. I want you to be happy with yourself, your body and your life. There is just one thing that has to be done first. Care for yourself. Listen to your body. Get back on or stay on that necessary, nurturing individualized regimen of Chiropractic. There is nothing else out there that can do what it does. Only when your spine is clear will your body and brain communicate with one another efficiently and functionally. And that only happens when you get adjusted! Inch by Inch (adjustment by adjustment, sitting up straight every day, not lying on the couch, shoulders back & chin up, taking that billfold out of that back pocket, unloading your purse, listening to your body) it will be a cinch!